Getting your home burglarized is a traumatic experience for any family. Aside from losing your valuables, the feeling of insecurity – that strangers can just walk into your home without your knowledge or permission – will linger far longer than your financial losses. But you are not helpless against thieves. In fact, with the help of available technology and proven practices, you are now better equipped to secure your home against criminals. Read on and learn our tips on how to secure your home from intruders and criminals. Install an alarm system if you can afford the cost. Aside from being caught, the only thing that thieves are afraid of is to advertise their presence, and a wailing siren in the middle of the night is certainly a big deterrent to these criminals. Teach every household member how to secure your home. Make sure that everyone – from the kids to the house help – will develop the habit of properly locking doors, securing windows, activating and deactivating the alarm system, and other security measures that you’ve put in place. Pet dogs are the best alternative to alarm system. And they’re cuddlier too. The loud bark of a guard dog has the same effect as the piercing scream of an alarm. Just because you have your cash securely locked away in the banks does not mean that you don’t have anything else to put inside a safe. Jewelry, important documents, and other valuables need to be secured too. Some reported burglaries happened with the thieves walking through the front door. No signs of picked locks or damaged windows. The culprit? The “hidden keys”. Hidden keys under the flower pot, in the mailbox, near the first window are not hidden at all. Thieves know where you are likely to hide an extra key, if you ever have one. If everyone in the house needs their own key, then have your keys duplicated by a trusted key maker. Hiring a full time guard to watch over your house might be way above your pay grade. So avail of the next best thing – your neighbors. Make friends with them. By introducing your family members to your neighbors, they are more likely to spot – and hopefully scare away – thieves who are planning to burglarize your home. Thieves are more likely to skip your home if they are aware that it is protected by an alarm system. Let them know this, in bright and bold letters. Ask the security company that installed your alarm system for security signs that you can post around the house. Buy or create your own if they don’t have them. Post these signs in conspicuous places around the house to make sure that everyone will know about your security precautions. In fact, don’t advertise your valuables anywhere. Thieves have now moved their activities online – scouting targets through their Facebook, Instagram, and other social media accounts. So be wary about posting pictures of your newly bought jewelry online. Remember, not everyone in your “friends” list is a real friend. Some of them may be opportunistic trolls just waiting to strike when you are not home. Of course, they’ll know when you’re not home because you’ve just posted online the itinerary of your next Caribbean Cruise. No, you don’t have to build a high fence with a watch tower around your house to make it more secure. But while you don’t have to resort to outrageous ways just to prevent break-ins, it is also wise not to give criminals easy access to your home. Inspect windows and doors for damages, and fix them if necessary. Burglars will look for the most vulnerable part of your home, and a broken window pane certainly qualifies as one. Secure your garage as much as you secure your own bedroom. That means no remote controls and garage keys lying around visible to everyone. Always lock them inside a drawer when not in use. If you really want practical tips how to secure your home, the first one that you must heed to is treat every door the same. Don’t give thieves a free pass into your home by replacing all broken locks around the house. Conduct an overall inspection of all doors and windows to make sure that their locks are operable and secured. Burglars can easily sneak into your home through an unsecured window air conditioner. Cheap and lazy installers do not normally provide metal grills or bracket for them so you may need to have one fabricated. Make sure to use one that cannot be removed from the outside. Always keep an outdoor light on all night. 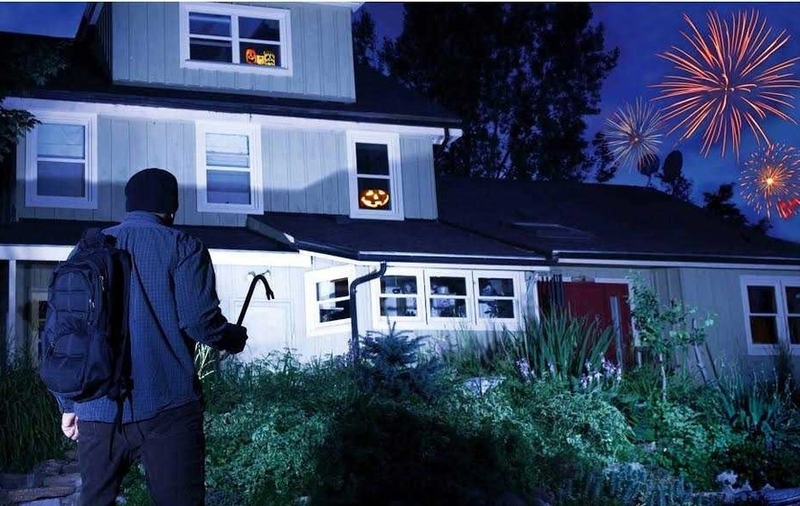 Opportunistic thieves are more likely to pick a totally dark house over a well-lighted one. You can also help deter thieves by having one lighted bulb inside the house. Security experts suggest leaving the bathroom light on, as people go to the bathroom at all times, and so thieves will think that someone is still awake and will think twice before breaking in. This is especially true to multi-storey houses. An intruder can use the ladder to gain entry to an open second-floor window. Imagine your shock when, after performing all the necessary security measure around the house, you still find your place burglarized by someone using your very own ladder! Trim tall brushes around the house so that your neighbors will have a clear view of your home. This is really helpful if the house is empty most of the time. Security experts even discourage building tall fences that obstruct the view of your neighbors. Remember? As we have mentioned earlier, enlisting the help of your neighbors is a very effective way of how to secure your home. Server responsed at: 04/23/2019 10:42 p.m.